But I must say, I can never remember where I stand with people, but Charles, yes, I like that wolf. Did I always? Who knows, I am too tired to check my old reviews. Brother wolf is a softie too. Charles and Anna go to meet an old friend. Oh uh, the Fae are up to no good. Stuff is going down! They are in the middle of something so they investigate. I do think the previous book was stronger, I remember that one as amazing, so this one is not equal to that one. But it is Briggs, which means it is good. She is good, always. I have not really said anything when I come to think of it. ..oh how I ramble on. Anyway, yes read the book, but you HAVE to read them in order. SO no starting with this one. I've only read Alpha and Omega - the how they met story and remember loving it. Faes are always up to no good, aren't they? Happy Friday! I need to start this series now that I am all caught up on Mercy. Did you try your library for the latest Patricia Briggs? I felt similarly that the previous books, especially Fair Game, was just SO GOOD that this one felt alright but not amazing in comparison. The new Mercy book is great, though, so I hope you get to it soon! I need to try this series! And definitely catch up on the Mercy series! I thought the themes in this one came together better -- family and death and parenthood. The previous one had a tighter plot. I liked the tighter plot in the last one, but yes the themes worked well together in this one. Laughing at your review, you crack me up. I read the first one and must read on. 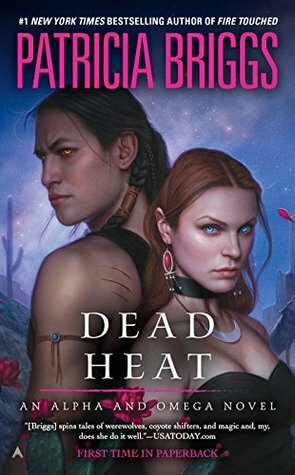 It's good you're reading this series too, because I hear the this and Mercy Thompson really complement each other, so you should be all set going into Fire Touched. It makes me think I should start this series too! I've always wanted to, but haven't yet found the time. LOL! I feel your pain. Waiting is the hardest thing with this series and her other one. Love Bran, too. There is never enough Bran in any book. I actually like Alpha & Omega just a smidge more than Mercy Thompson. I just love Charles and Anna, and yes, Brother Wolf. This one was a little bit sad. I'm gonna tackle her Mercy series first before I jump into this one. Everyone seems to love both series a lot. These books have the oddest looking covers, I swear. But heck, Patricia Briggs is an awesome author that I don't really care. Lol. I need to get caught up on these. I love Charles and Anna so much! This one wasn't as strong as the previous but still good. I wish I could get you Fire Touched NOW! About Fire Touched. If you like to read in print, is it important which cover the book has? I happen to have an extra copy of Fire Touched, but it's the UK cover and the weirdly big paperback version. If you'd like to have it anyway, I could send it to you. maybe one day or not. But I hope for one day. Omg for reeeels! Yes! Of course I would love that. Sure I love some covers but in the end I do not care as long as I have the book.